For several years, at every opportunity, I have been emphasizing that the role of culinary elements in video games should be treated with greater attention by developers, mainly due to their significant impact on building a culture of virtual universes and widely understood immersion. Of course, this is not necessary in all game genres (such as racing simulators or shooters), but ask yourself whether world of The Witcher 3 would be just as atmospheric without inns and numerous mentions of specific dishes, or whether Don’t Starve would be so engaging if not equipped with extensive cooking mechanics and a varied list of dishes, or if the cake from Portal would be changed to the promise of receiving a hat, would it really be as much motivating for the player? Exactly – at first glance, the culinary topics seems to be of no great importance in games that ultimately don’t strictly speak about food. However, well-thought-out and properly integrated with the gameplay and the universe itself, culinary and food elements have enormous power, thanks to which the game can get to the next level of good game design. For this reason, te core of this blog, which is the recreation of fictional, video game dishes in real life, is only one part of what I always wanted to do in connection with the culinary aspects of the games. I have always been interested in the whole process of video game food design – from idea to implementation – also because I professionally deal with game design, except that it is only in the field of serious games, where it is difficult to implement culinary content. So my aspirations to become a food game designer finally found their place in Crossroads Inn project by Polish publisher Klabater and studio Kraken Unleashed, to which the team invited me less than a year ago. 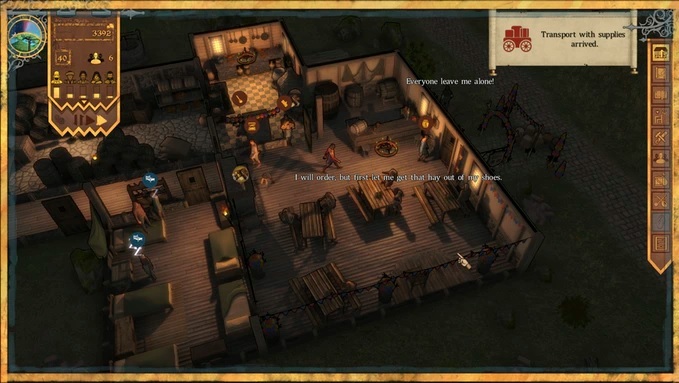 Crossroads Inn is a tavern management simulator with elements of economic strategy and RPG. The main protagonist is Martyn Bradver, the owner of the title inn located at the intersection of the main routes of the Delcrys land, which in addition to taking care of the business (managing the inn’s staff and deliveries or work on the menu and a range of services to meet the needs of various clients), must also bear in mind political intrigues which emerge over time. 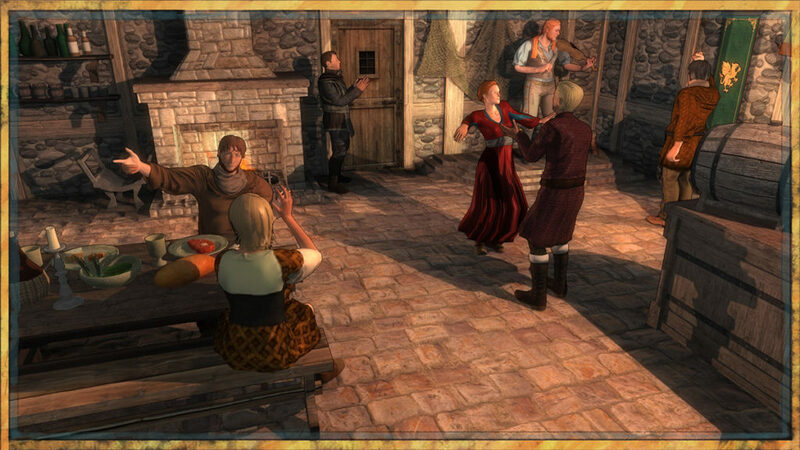 Together with the game team, we have created a rich culinary system containing an original set of dishes tailored to the varied charateristics of the 3 lands of Delcrys and a comprehensive range of ingredients tailored to the inn clientele. I must admit that I am very happy with the final result, because what we have managed to create together confirms what I wrote at the very beginning of this post. 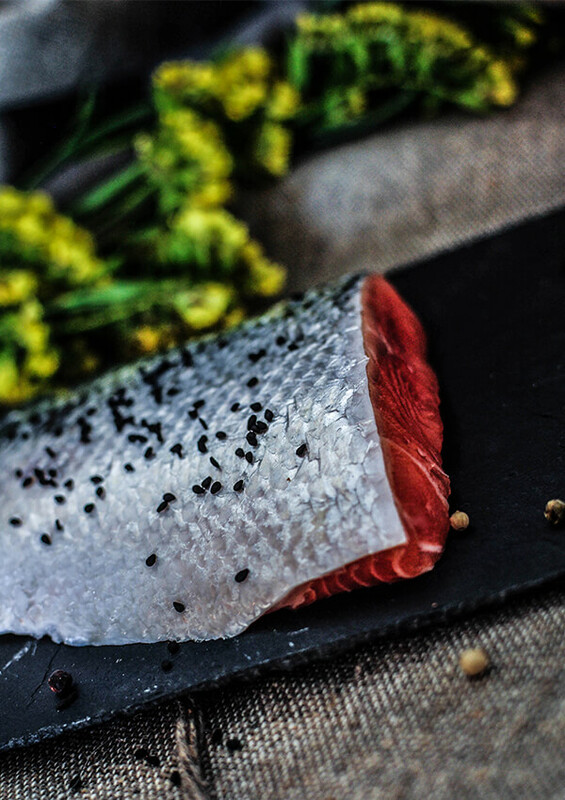 Thanks to our efforts in the field of culinary aspects, the game and its universe have gained a richer dimension and originality. At the same time, I am proud that it will be the first title on the market in which dishes are also the result of my work. 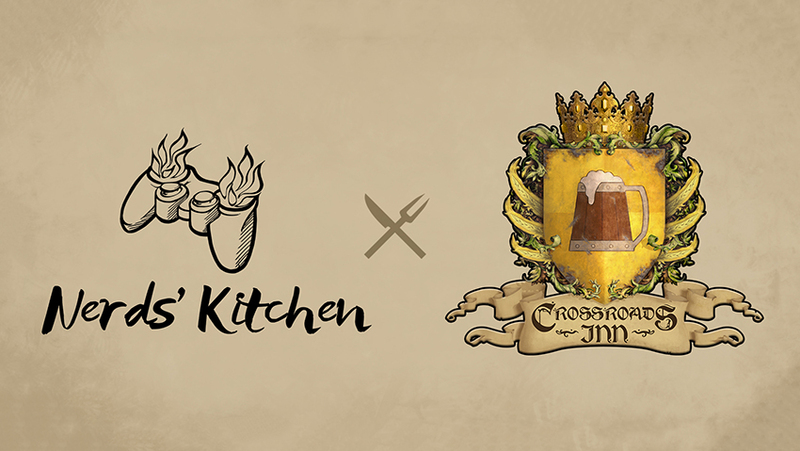 In addition to aspects related to the mechanics, we have also developed 12 recipes for the legendary dishes from the game and included them in the “Crossroads Inn Cookbook” – which you can get in the form of an e-book or a printed version supporting the fundrising of the studio on Kickstarter. I would also like to mention that the culinary-graphical aspect of the game has been well taken care of – after all, the mechanics associated with the food is not everything – even virtual food should also attract you visually. In the case of Crossroads Inn drawings of dishes’ icons made by Jakub Balewicz have a lot of details and interesting colors, so I think that they can easily make your mouth water 😉 So I strongly advise to avoid playing on an empty stomach. I keep my fingers crossed for Crossroads Inn team – I hope they will be able to create a really tasteful, captivating title. We’ll find out soon how the game looks in the practice because the release is planned for this year. Currently, the studio has launched a fundraiser for game’s refining purposes on Kickstarter – if you would like to get the mentioned e-book or its printed version with our recipes, it is worth to familiarize yourself with the pledge levels and support this project with your currency! However, in this post I have a special bonus for you – one of the mentioned legendary recipes. I proudly present sweet fish dumplings from Bersuhl, derived from the culinary traditions of the land of Untermarch, known for its courageous warriors and the frosty climate. 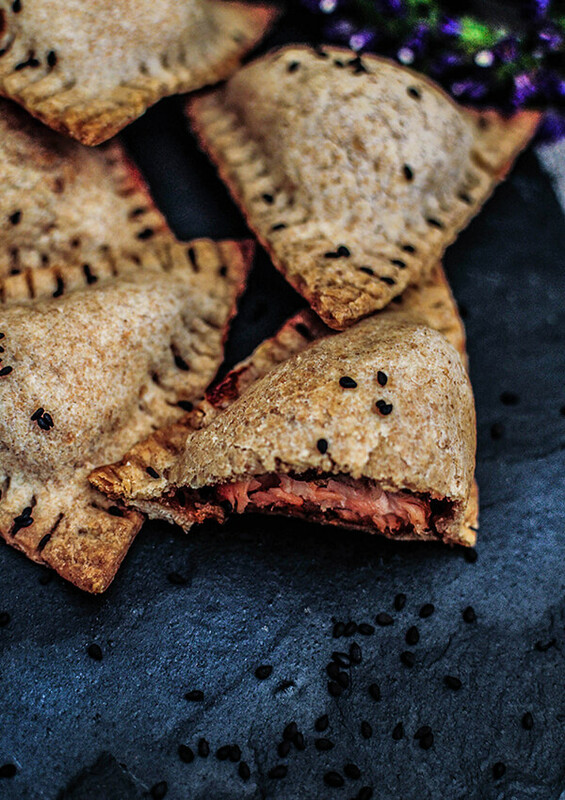 This region, despite frequent shortages in food, is characterized by the extraordinary creativity of local chefs who can conjure up nutritious, warming dishes from basic, available ingredients. It’s was similar with the sweet dumplings from Bersuhl, the city of weirdoes , where sugar is added to the fish were created! 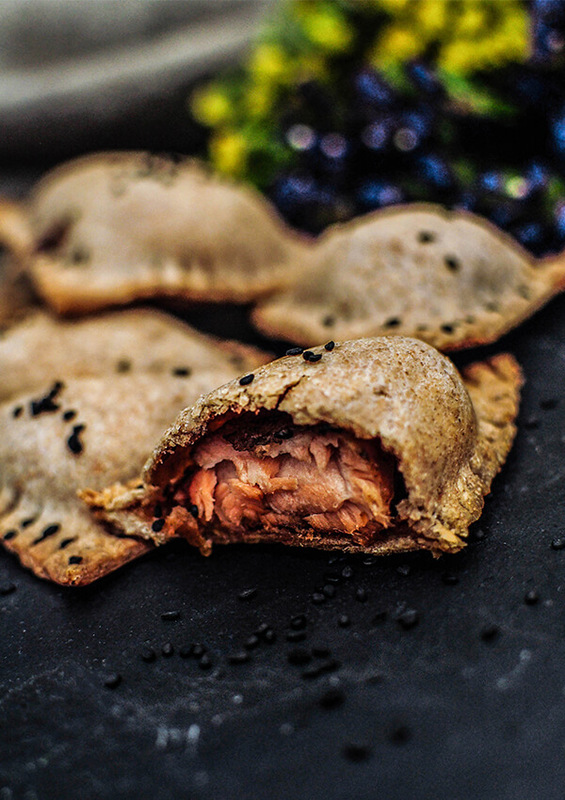 Juicy, pink salmon meat bought at local fishermen, wrapped in a sweet and sour marinade and enclosed in a crunchy, rustic dough creates a simple, but beloved by many, a nutritious appetizer. It’s time to make your palates fall in love with them too! Off to work! Wash the salmon, then separate the meat from the skin. Get rid of the skin and any remaining bones. Cut the fish into triangles (approx. 3.5 cm x 3.5 cm x 6 cm). Add the ingredients for the marinade to the pan; mix and cook until a thick sauce is obtained. Cool to room temperature. Put the pieces of fish into the marinade, then cover and set aside for 20 minutes. Make the dough: mix the two kinds of flour, then add the salt, oil and lukewarm water. Knead the dough for a couple of minutes until a smooth, elastic texture is achieved. Cover the dough with a bowl, and set aside for 20 minutes. Roll out the dough to approx. 1–2 mm thickness. Cut it into triangles, 1 cm bigger on each side than the fish pieces. 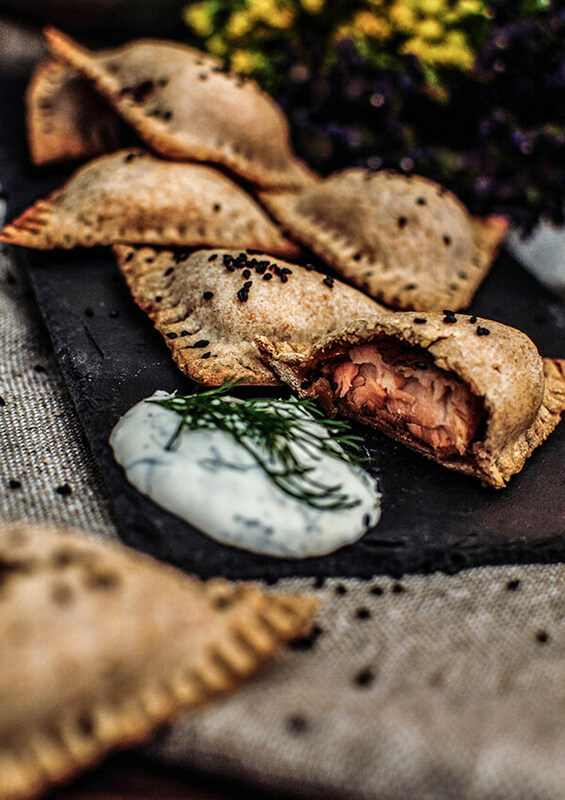 Arrange the fish in the middle of a triangular piece of the dough. Sprinkle the second triangle lightly with water on the inside (for better gluing). Put it on the first piece and close the dumpling tightly by pressing the edges with your fingers. Make a decorative strip with a fork. Trim off the excess dough. Transfer the dumplings to a baking tray (you can use a sheet of parchment paper). Spread oil over the top of them, then sprinkle with sesame seeds. Bake at 170°C / 335°F for 25–30 minutes until golden. Best served hot with cream mixed with pepper, salt and chopped dill. Eat for honor and glory of Untermarch, sipping some good beverage and listening to local bard’s songs who sits in front of a burning fireplace. We ask for your patience - our website is under construction and some features may not be working properly. Soon everything will be back to normal! All the best - Nerds' Kitchen!